THE US Congress has declared a veritable war on the environment. This summer, it debated a series of rollbacks of federal laws protecting the environment. However, after losing crucial congressional battles earlier this year, environmentalists are now launching their own concerted counterattack. In the most killing blow to the environmental movement yet, the House of Representatives voted to cut the Environmental Protection Agency's (EPA) budget by one-third - to about us $4.9 billion - in late July; this is us $2.5 billion less than what President Clinton's administration had sought. EPA enforcement and rulemaking activities were also sought to be curbed through a host of riders. The blow came when environmentalists were still reeling from an earlier attack: the controversial Rescissions Bill . This bill, containing the infamous "logging without laws" amendment had been made into a law (Down to Earth, Vol 4, No 8). Clinton had vetoed the original bill, saying it would "essentially throw out all of our environmental laws and the protections that we have." But on July 27, he caved in and signed a slightly modified version. Clinton's capitulation led to angry demonstrations in front of,the White House, led by Gene Katoinski, executive director of the us Public Interest Research Group (PIRG). The not-so-subtle game of offensives and counteroffensives began in spring with talk of "regulatory reform". Conservatives in the House wanted to radically modify the federal rulemaking process, arguing that federal environmental laws are too burdensome and costly for industry, property owners and state and local govertirrients: people lost valuable land only because an endangered species may be found there, cancer rates in the us were decreasing making regula tions meaningless, occupational safety laws resulted in thousands of dollars being spent on the most minor hazards... the list of 'silly regulations' was almost endless. Instead, Republican lawmakers wanted to streamline public health, safety and environmental programmes by subjecting them to risk assessment and cost-benefit analysis. Environmental groups were caught off-guard. Says Katoinski, "The extent of the attack on the environment was well disguised and difficult to explain to most people on the streets." Conservationists contend that reforming the regulations would turn back the clock on more than two decades of environment protection (see box). The greens were quick to organise a spirited offensive, the centerpiece of which has been the 'Environmental Bill of Rights' petition, launched by Sierra Club, an environmental organisation, and the PIRG. "Every American," the petition declares, "has the right to a safe and healthy environment. We oppose any measures that would roll back the environmen' progress of the last 25 years... and will hold public officials w represent us accountable for their stewardship of the planet." 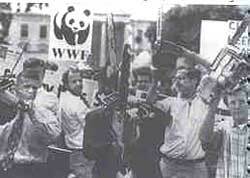 According to Bruce Hamilton, conservation director Sierra Club, it was more than a signature-gathering exercise; it was about educating and mobilising the press, the public and politicians. The response to the petition has been overwhelming. More than a million Americans have so far signed it. The message from the people to the Congress seems to be clear protect the environment or pay the price. But it hasn't been easy. Observes David LaRoche, chief staff, International Joint Commission, us and Canada, has also worked with NGOS for years, "Over the years, man the conservation organisations in the us have moved from their grassroot support bases into more of lobbying. But with the majority party in the Congress changing, they suddenly found they have no clout there." But necessity is the mother of invention. And of strange A 21-chainsaw salute to Clinton: ecologists protest in Washington bedfellows. In a quick change of strategy, the war on the ronment has seen many environmental organisations scrambling for new allies. Greenpeace, for instance, has enlisted the support of fishing groups in a campaign to salvage the nation's stocks. Others are cultivating contacts with religious organisations. The back-to-the people strategy seems to be yielding results. After witnessing downward trends through the 198os and the early 1990s, memberships and contributions for envi ronmental organisations have once again started rising. Says Hamilton, "If we can mobilise public outrage against the antienvironment votes (of representatives in the Congress), we can either turn around their future votes or turn them out of office in the next election cycle. Meanwhile, the White House seems to be doing a flip-flop on environmental issues. "Clinton is not even trying to be the environment president," says a disgusted Carl Pope of Sierra Club. "He seems to have made a political calculation that the public is not concerned about these issues, and that's a terrible mistake." Most opinion polls bear him out; in a recent survey conducted by the Mellman Group pollsters, for instance, 62 per cent of the respondents felt that Congress should do more for the environment. Only 29 per cent thought it should repeal some regulations. But the lobbying continues, albeit in a different form. In November last year, alarmed conservation groups pooled their resources with traditional funders of the environmental movement to form the Environmental Information Centre (Etc) to combat environmental misinformation, especially the anti - environment tirades in Congress. This summer, even as the House of Representatives debated the "risk assessment" bill, EIC'S Washington office functioned as the war room for a massive public education campaign. As representatives gave the House examples of regulatory injustices inflicted on American citizens, the Fic verified the truth in these cases by going back to the sources. The results were brought out in a report, Polluting the Truth. Virtually every one of the stories was found to be fabyicated or a distortion of facts. In an attack on the Clean Water Act, for instance, representative Ed Bryant (Tennessee) related an anecdote about a farmer who lost 202 ha of prime land when a beaver built a dam. "Why?" queried Bryant in the House, "Because federal government says it can't remove the beaver dam as it had created a wetland." Yet, removing a beaver dam does not require a Clean Water Act permit. Asks the report, "How big was this beaver that built a dam that flooded 202 ha?" The Senate is currently considering the bill passed by the House for a drastically-reduced EPA budget. Although the Senate Appropriations Subcommittee voted in September to restore some of the cuts, the victory for environmentalists has been only partial. Besides, with more anti-environment laws on the anvil (see box), environmentalists cannot afford to take a breather.